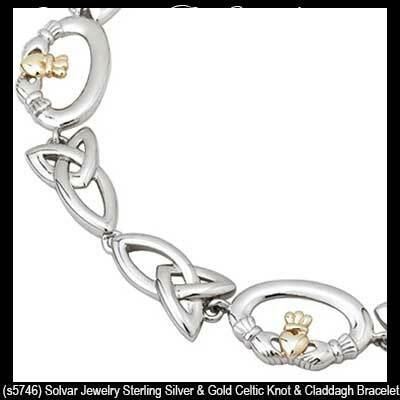 This sterling silver Claddagh bracelet features Trinity knot links along with 10K gold accented hearts. This sterling silver Claddagh bracelet features four Claddagh links that are enhanced with 10K gold hearts and crowns along with eight Trinity knot links. The Celtic Claddagh bracelet measures 7 1/2" long and is complete with a lobster claw catch. 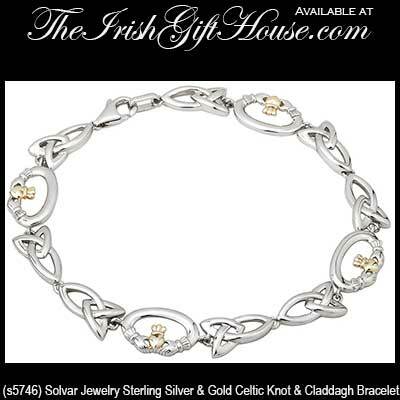 The Irish bracelet is made in Dublin, Ireland by Solvar Jewelry and it is gift boxed with the Galway Folklore along with Celtic knot and Claddagh history cards that are complements of The Irish Gift House.